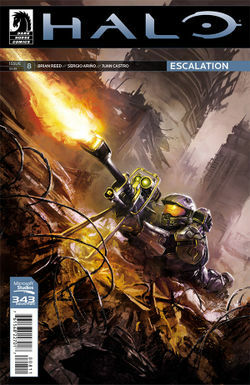 Halo: Escalation Issue 8 was released on July 23, 2014 and is the eighth comic in the Halo: Escalation series. It marks the beginning of the three-issue story arc "The Next 72 Hours", focusing on events immediately following the Halo 4 campaign, whereas the previous issues followed up on the story of Spartan Ops months later in the timeline. Issue #8 opens with John-117 recollecting the events at Requiem, Ivanoff Station, and Earth that resulted in the destruction of Cortana and the disappearance of the Didact. After the flashback, the scene cuts to July 25, 2557 with John being debriefed by the UNSC Security Council. The Master Chief confirms that Cortana and the Composer were both destroyed over Earth, but he was unable to confirm the Didact's death. With there being no proof of a living Forerunner, the Council decides to tell the general public that the attack on New Phoenix was caused by the Covenant and ended by the return of a hero, the Master Chief. Following his meeting with the Security Council, the Master Chief meets with Lord Terrence Hood. Hood asks the Master Chief if he could advise a team on Installation 03 to investigate the loss of contact with a science team escorted by Spartan Team Black on the ring. The Master Chief meets with Blue Team, consisting of Fred-104, Kelly-087, and Linda-058. The team takes a GA-TL1 Longsword to the installation and lands in a desert, nearby the science team's camp. With no response from Team Black, Blue Team continues to move towards the science camp. Along the way, Linda spots Promethean Crawler footprints in the sand leading towards the camp. Upon entering the camp, they find the bodies of the deceased science team. Fred soon finds the bodies of Team Black, dead. While looking for Team Black's killer, the Spartans are attacked by Promethean Knights. After a short firefight, Blue Team destroys the Knights and continues on in the desert. The team discovers an uncovered structure in the sand, the former location of the Composer. Upon entering the structure, the Spartans discover the Composer's Abyss, a facility used to store victims digitized by the Composer. At the end of the Abyss, the Spartans discover a slipspace portal and ponder what to do next. Meanwhile, on an unknown world, a monitor flies around a Forerunner city with a moon looming overhead. The monitor speaks to the Didact and solemnly reveals that Blue Team has found the portal. However, the Didact claims that he looks forward to welcoming the Spartans to his world. Kelly, Fred, and Linda are depicted wearing armor similar in design to John-117's superficially overhauled Mark VI MJOLNIR armor, even though the Master Chief's suit was uniquely upgraded by Cortana during his time in cryosleep and based on the likeness of a Mark IV variant. A post by Catalog suggests that Blue Team has received similar upgrades (perhaps for the second generation of Mark VI) due to their priority access to new equipment, though when this occurred is unclear. John's and Blue Team's upgrades may have been derived from plans that existed before John lost contact with the UNSC. Alternately, these upgrades may have occurred at some point between the Master Chief's first contact with Infinity on July 22 (via FTL communication with HIGHCOM) and his reunion with Blue Team on July 26. Regardless of the backstory for Blue Team's armor, the members of Team Black are shown wearing their original MJOLNIR Black variant armor which is superficially identical to the original Mark VI. Kelly-087 and Linda-058's respective roles as scout and sniper are reversed in one panel. The same panel misspells Frederic-104's name as "Fredric". Linda-058 is depicted with light blue eyes similar to Fred and Kelly; in the novels, her eye color is stated to be dark emerald green. Her hair is also depicted as being copper colored rather than the distinctive "blood-red" specified in the novels. Generals Strauss and Hogan discussing the finality of the Didact's defeat. John-117 is debriefed by Lord Hood. The reintroduction of Blue Team. Blue Team aboard their Longsword. Blue Team's Longsword over Gamma Halo. Blue Team approaching the science team's camp. John-117 and Kelly-087 find the dead scientists. Fred-104 and Linda-058 discover the corpses of Black Team. The Spartans are ambushed by Promethean Knights. Blue Team fighting off the Knights. Blue Team discover the slipspace portal at the end of the Abyss. 859 Static Carillon informing the Didact of the Spartans' arrival. The Ur-Didact is revealed to be alive.